Quickly see when pools were tested from anywhere to ensure compliance and oversee remote locations. All recorded information is instantly available from mobile device or computer. 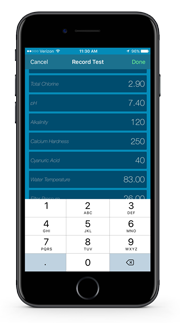 Efficiently record pool chemical tests and usage on your mobile device. Offline recording available on IOS devices. Android and other devices require an internet connection and a current browser. Automated alerts notify you when pools require attention. Ensuring you stay informed even when you are away. User management provides unique logins for each staff member. Seasonal staff accounts can be de-activated in the off season and activated again the following year. 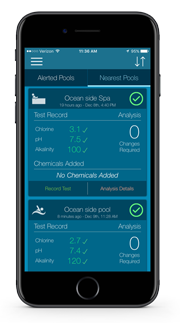 Quickly record the results of pool chemical testing, usage, and notes on your smart phone, tablet, or laptop while you are on-site. All information is securely stored in the cloud, eliminating the need for syncing devices at the end of the day. The Pool Shark H2O system allows customized pool logs for each pool. Turn on the pool chemical tests required by your state or county and turn off the tests you don’t need. The formatted reports and downloads only display chemical tests you record. Our custom report builder lets you easily create checklists and report forms specific to your facility. All your records will be stored securely and available when you need them. Provide staff specific instructions, capture names, dates, photos, signatures and more! Support for Unlimited Pools keeps all your pool log books, chemical usage logs, and notes in one place and always available. Our patented smart search displays pools closest to your location, making chemical logging faster and helping to eliminate errors entering data for the wrong pool. The optional notes field allows detailed notes to be kept each time the pool is tested. Marking a note as “High Priority” generates automated messaging alerting those staff members who need to know. Who doesn’t want to swim in a crystal clear pool? Dosage amounts for Chlorine, PH, Alkalinity, Calcium Hardness and Cyanuric Acid are automatically provided for you with every test entered. 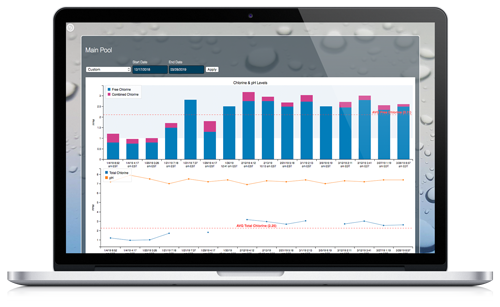 The Pool Shark H2O system uses the test data and the pool information to determine the correct dosage needed to keep your pool chemicals in the ideal range. All calculations based on Model Aquatic health Code and the National Swimming Pool Foundations Operator Handbook. Wondering how many bags of Shock to put in your pool? Our easy to use breakpoint calculator making this task quick and easy! Quickly and easily enter any chemicals you add to the pool for maintenance. 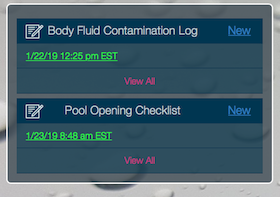 These logs provide an easy way to track the amount of chemicals each pool is using for inventory and ordering purposes. Pool test results can be viewed online by any of your staff as soon as they are entered. Pool Log information is kept for a minimum of 2 years as required by some states. Administrators can get reports as formatted emails with pool chemical tests, and usage log data. These reports can be printed out or emailed to state inspectors as required to keep in compliance with regulations. The entire Pool Chemical Log Book and the Pool Usage Log are available for download by administrators. These copies can be used for a local backup or importing into additional systems like Quick Books, if desired. Join today and get a 1 month, No Obligation Free Trial.